Public demonstration takes place on Thursday, March 10, at 6:30 p.m.
Robots built by UC Santa Cruz engineering students will act out the roles of bulls and toreadors in a free public demonstration on Thursday, March 10, at 6:30 p.m. in the Media Theater on the UCSC campus. A live webcast of the event will be available online. The mechanical bullfighting competition is the final project for students in the Introduction to Mechatronics class taught by Gabriel Elkaim, associate professor of computer engineering in the Baskin School of Engineering. The students work in teams to build a "droid" or robot that can act both as a bull, to "gore" the toreador by ramming it, and as a toreador, to place "banderillas" (ping-pong balls) into a target on the back of the charging bull. "The purpose of this project is to give students an opportunity to apply all that they have learned in the class to solve an open-ended problem," Elkaim said. 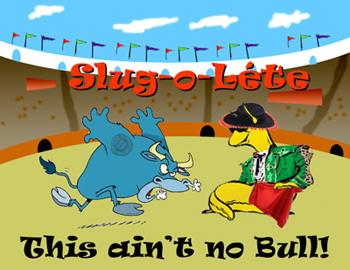 This year's competition is called "Slug-O-Léte: This Ain't No Bull." In his instructions to the students, Elkaim explained, "The most famous of toreadors, Manoléte, was gored to death in the ring. Your droids, the Slug-o-létes, will demonstrate how it's done."